Smartphones, MP3 players, sports electronics devices such as pulse meters or trackers, medical equipment such as tonometers, pacemakers of the heart, or insulin pumps: An increasing number of electronic companions make daily life easier for us. But as useful these smart helpers may be: Their constant hunger for electricity is a problem. The solution: power supply by means of energy produced by body movements. This is the research subject of scientists at the Karlsruhe Institute of Technology (KIT). "If you want to harvest the energy produced by movements of the body, the challenge lies in the requirement that this power generation must not demand any additional power input by the user," says Christian Pylatiuk of the Institute for Applied Informatics (IAI). The physician and his team have developed two systems that meet this requirement: One design for the lower extremity uses body weight during walking. One small cushion each filled with a liquid is installed under the heel and the ball of a walker. Impact on the ground and rolling off causes oil to be pumped back and forth through a hose connection, in this way, very much like a miniaturized tidal power plant, driving a piston which, in turn, drives a generator. This miniature power plant was installed by Pylatiuk in a foot prosthesis equipped with sensors actively supporting the movements of the wearer. 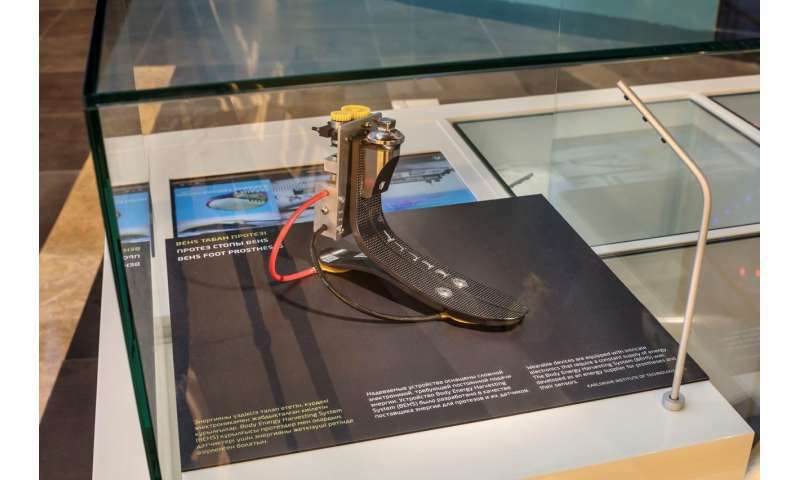 "However, the mechanism could just as well be installed in a sports shoe to operate a speed trainer or a performance diagnosing system," says Pylatiuk. A different generator can be worn on the wrist like a wristwatch. The special difficulty in this case: To operate a generator, the highly discontinuous movements of the arm must be converted into a continuous movement. For this purpose, Pylatiuk fell back on proven technologies: The mode of operation is similar to that of an automatic watch." Unlike a clockwork, where energy is stored by a gyrating mass cocking a spring, an induction motor is used in this case in which an eccentric element moves a magnet back and forth in a coil. The maximum power of 2.2 milliwatt is not yet sufficient for instance to run a hearing aid or charge a smartphone. However, "we are currently working on a more powerful consumer version," says Pylatiuk. He expects results to come forth by the end of the year. Explanation of the animation: Below the heel and the ball of the walker there are cushions filled with a liquid. The impact and the heel-to-toe motion of the foot causes oil to be pumped through a hose connecting the two elements, in this way, like a miniaturized tidal power plant, operating a piston which, in turn, drives a generator generating power.